Many women who have been diagnosed with cancer think preserving their fertility is important and want information about their options. However, patients may not feel comfortable bringing up fertility issues. Women may later regret not considering fertility issues prior to starting cancer treatment. Even women with a poor prognosis may want to consider fertility preservation. Fertility Preservation - Where Does It Fit? The following table gives a brief description of options available to women who wish to preserve their fertility. The American Society of Clinical Oncology and American Society for Reproductive Medicine recommend, when possible, at-risk patients be referred to a fertility preservation specialist prior to starting cancer treatment. Several resources are listed on the reverse that can help you and your patients locate a fertility preservation specialist. Remember there are other ways to build a family after cancer if we are unable to preserve your fertility now. Talking with a specialist can help you explore other options that might be right for you. GnRH analogs used to suppress ovaries During treatment In conjunction with chemotherapy Data are mixed on the effectiveness of this option. Cancer and cancer treatment may affect your fertility. Based on your treatment plan, your risk of infertility is [high, moderate, low] (see table below). Although it may not be on your mind now, it is important to discuss fertility before you begin treatment. You may have options for fertility preservation before you begin cancer treatment (see table above). Not all women experience infertility after cancer treatment, however it is still important to explore your fertility preservation options before treatment. I can refer you to a fertility preservation specialist if you would like to discuss your options further. The following table classifies various cancer therapies and regimens based on their known infertility risk in women (defined as permanent amenorrhea). While this table provides general guidelines, each patient is different and treatment may impair their fertility differently. Table adapted from Fertile Hope, an initiative of LIVESTRONG; Cancer and Fertility: Fast Facts for Reproductive Professionals (2008); and Meirow D, et al. Clin Obstet Gynecol. 2010;53:727-739. Use the online Clinic/Center Finder to find the fertility preservation center closest to you. The Ethics Committee of the American Society for Reproductive Medicine. Fertility preservation and reproduction in patients facing gonadotoxic therapies: a committee opinion. Fertil Steril. 2013; 100:1224-31. De Vos M, Smitz J, Woodruff TK. Fertility preservation in women with cancer. Lancet. 2014;384:1302-10. Jeruss JS, Woodruff TK. Preservation of fertility in patients with cancer. N Engl J Med. 2009;360:902-911. Loren AW, et al. 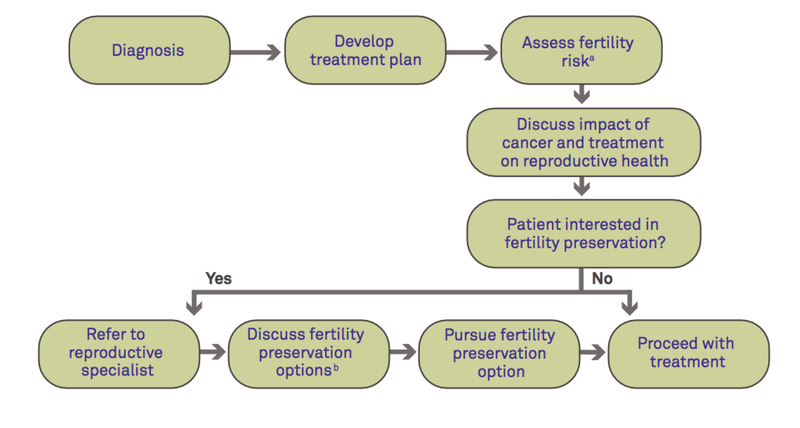 Fertility preservation for patients with cancer: American Society of Clinical Oncology clinical practice guideline update. J Clin Oncol. 2013; 31: 2500-10. Meirow D, Biederman H, Anderson RA, Wallace WH. Toxicity of chemotherapy and radiation on female reproduction. Clin Obstet Gynecol. 2010;53:727-739. JM Letourneau, EE Ebbel, PP Katz, et al. Pretreatment fertility counseling and fertility preservation improve quality of life in reproductive age women with cancer. Cancer. 2012; 118:1710–1717. Levine JM, Kelvin JF, Quinn GP, Gracia CR. Infertility in reproductive-age female cancer survivors. Cancer. 2015;121(10):1532-9. Tschudin S, Bitzer J. Psychological aspects of fertility preservation in men and women affected by cancer and other life-threatening diseases. Hum Reprod Update. 2009;15:587-597. Woodruff TK. The Oncofertility Consortium—addressing fertility in young people with cancer. Nat Rev Clin Oncol. 2010;7:466-475.